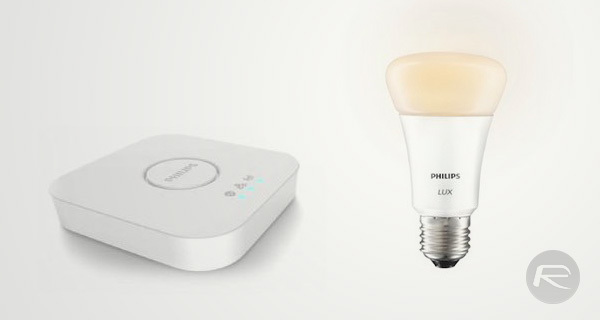 Users of existing Philips Hue lighting accessories were pleased to learn recently that the company would be making it possible for existing bulbs to work with Apple’s HomeKit platform. How that was going to happen wasn’t entirely clear, and with HomeKit support not able to be added via a software update alone, new hardware was going to be required to get the ball rolling. Now, thanks to a leak by a Dutch lighting store, we know just what that hardware will be. Dubbed the Philips Hue Bridge, the device looks like a white Apple TV and will act as a go-between for the existing Hue hardware in your home and Apple’s HomeKit. When all set up and configured, the Hue Bridge will allow any Hue lights to interface with HomeKit, meaning, in addition to remotely turning them on and off the old way, iOS devices will be able to use Siri to do the same as well as carry out more complicated actions depending on the hardware at hand. Philips will have to update its companion app, of course. 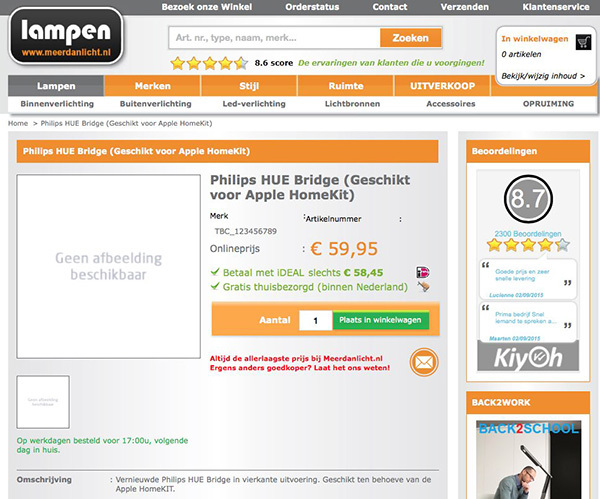 The arrival of the Hue Bridge hasn’t yet been officially announced by Philips and the store entry has now been removed by the Dutch website that outed it. That didn’t happen before screenshots of the entry were taken, with the Hue Bridge listed as costing €60. We don’t yet know when this hardware will go on sale except that it’s coming sometime this fall or indeed how much that price will be when translated to international currency, but just the fact that we know the Hue Bridge to exist should give hope to those who kitted their homes out with Philips Hue light bulbs not too long ago, only to find that they aren’t natively compatible with HomeKit. Having got off to a stuttering start, Apple is expected to give HomeKit some time at its September event next week, although we don’t expect too much of the event to be handed over to the home automation features offered by iOS. this is bull. we should be shipped the correct hardware for free. I’ve spent A LOT of dough outfitting my entire home with hue bulbs. to spend more for software functionality is BULL. if they cant fix it with software update the hardware should be free. its not my fault you didn’t future proof your design. if you want to keep me as a satisfied customer and allow me to continue recommending your products then the bridge should come free. $98_per_hour special report!!! !……….After earning an average of 19952 Dollars monthly,I’m finally getting 98 Dollars an hour,just working 4-5 hours daily online….It’s time to take some action and you can join it too.It is simple,dedicated and easy way to get rich.Three weeks from now you will wishyou have started today – I promise!….HERE I STARTED-TAKE A LOOK AT….tgd.. If someone has trouble սոⅼοсking AT&T phones, because AT&T doesn’t allow user to ՍΝᏞΟᏟΚing their phone prior to the contract is over, you can check out just google atttiphooneuunlocking, it’s the fastest site for սոⅼοсking, we have the capacity to սոⅼοсking the newest 6S and 6C as well. Of course it’s your fault. You think Apple will just give you a new iPhone every year because they changed out their old hardware with new and improved hardware? Nope. Tech moves forward everyday, and so will we if we want to keep up. But they aren’t changing any “hardware” per se. They are the exact same bulbs as before. What’s different is they implemented a hardware box to do software authentication. Insteon products were in the exact same boat, however they were able to overcome their limitation without costing the consumer any money at all. I agree with you when you say that if the customer wants to stay current they need to abandon/attain hardware constantly, however promised functionality of a SOFTWARE Api should still be free. Not saying they should have free boxes, what I’m suggesting is they implement a better solution that doesn’t cost me money. It’s like Sony trying to sell you a new ps4 with an extra chip in it so that you can access a new feature. It’s not a new console, it’s just a hardware update. Dude just buy the Insteon stuff and be “happy”. Or go whine about it to Philips directly where they might actually hear you. This is a terrible place for that rant.